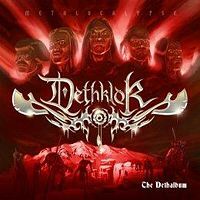 The new real-life album by cartoon band Dethklok – The Dethalbum, as it were – is pretty awesome. The songs are concise and sharpened to a deeply cutting point, the lyrics are pure doom and gloom, the chops fly fast and furiously, and the personnel includes players good enough to hang with the likes of Frank Zappa, Steve Vai and Devin Townsend. The problem is not in any of the music itself, especially since everything about this album is metal execution to a T, from the harmonized runs and sweeps to the partially offensive and entirely belligerent song titles (“Hatredcopter,” “Castratikon” and “Briefcase Full of Guts,” to name a few). Dethklok vocalist and mastermind Brendon Small even delivers the goods vocally via alter-ego/cartoon character Nathan Explosion in what amounts to something just slightly less than cookie monster singing – more like cookie monster spoken word, as though a Swedish metalhead were doing an impression of Tom Waits doing an impression of a Swedish metalhead. Is that a lot to wrap your head around? Of course it is, but don’t bother trying to put the concept in perspective; this isn’t a thinking person’s record anyway. The problem is not even in it being almost impossible to tell the difference between the art and the cartoon satire of that art. At times, it’s tough to decide if we should be laughing at Small & Co. or if we should be laughing with them; at others, it’s a matter of wondering if Small & Co. are actually laughing at us. When Explosion opens “Fan Song” by declaring that “you people out there give us something more than just record sales; you give us something to hate, and we hate you, you brainless mutants,” you know that Small doesn’t mean it, but you can’t help but wonder which of the countless bands out there – metal or otherwise – are thinking it. Nor is the problem that Dethklok is a fictional band. Spinal Tap, Tenacious D, and even Stillwater all rocked pretty hard without having any serious aspirations to advancing the cause and form of the music they were at once aping and worshipping. Real-life bands have gotten into the act as well, with numerous heroes, celebrities and luminaries of the metal world appearing on the Metalocalypse cartoon Dethklok is featured in. Among those, in fact, were none other than James Hetfield and Kirk Hammett of Metallica. These are two of the same guys who kicked bass player Jason Newsted out of their band for wanting to make music outside of Metallica for fear it would cheapen the band’s name, and then they go on themselves to appear in a cartoon mocking the very music Metallica takes so seriously. Band personnel moves as mildly ironic performance art. How very avant of them. No, the problem with The Dethalbum is that for all the album’s low ambition and ridiculous propagation of metal clichés, the fake band behind it pulls all those things off better than 99% of the legitimate bands making serious attempts anymore. When Small/Explosion tells you “blood is an energy conductor” while the most ridiculous performance in recent death metal history is going on behind him in “Bloodrocuted,” there is nothing to do but nod in gleeful agreement. We will all be bloodrocuted; Dethklok are simply the merry executioners flipping the switch. Bad metal never sounded so good. Then again, the band and the album title miss at least seven opportunities to use an umlaut – but no one’s perfect. May Dethklok revel forever in our mindless mutantry.